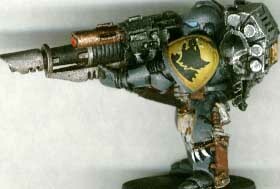 CLICK HERE FOR SHOTS OF SPACE WOLVES IN ACTION! 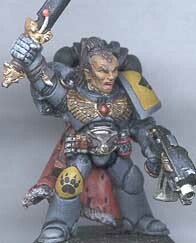 Space Wolves are one of the best supported chapters as far as miniatures go. They have such a big range I steal them for other chapters, especially the Scout Sergeant models (still available through mail order- for a price). 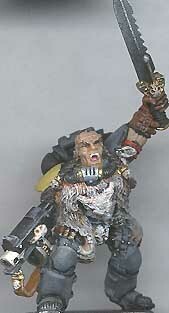 Of the three Space Wolf Scout Sergeant models, this was the most "wolfy", so I used him for my Space Wolves. Aside from a backpack swap, this is a stock model! 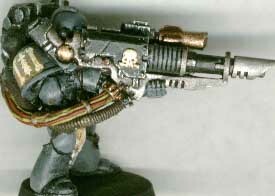 I liked the bare arms and leather gloves on this model, and painted them accordingly, along with the cool drum fed bolter complete with shoulder strap! I was quite pleased to see GW had switched over recently from the "blue-grey" color scheme to a more appropriate solid grey. 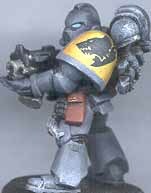 I've always painted my Space Wolves this color, and found that (with some work) you can really make grey look good! (More on that later). One of the old plastic scouts, rearmed with an autopistol and chainsword (both from the old plastic Marine Assault weapons sprue). 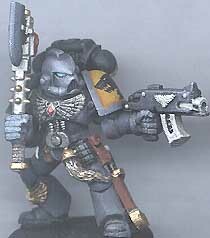 Although there is new background for seasoned marine scouts for Space Wolves, I still use the "youthful" scout models myself. A rear view of another rearmed plastic scout. Yellow trim looks great with grey, but I also use red occasionally, and here to good effect on the sleeves. I paint the greaves, pouches and belts leather to make the models look more rugged and primitive. The armor itself is grey, with steel highlights. I did these models a while ago, so the yellow isn't as deep as the other models, but the grey came out well enough. 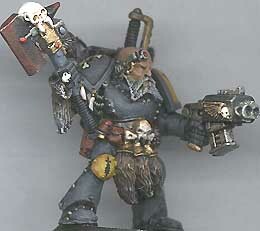 My Space Wolf captain is a converted Devastator Sergeant from the old Devastators boxed set. I loved the scope eye, axe, wolf pelts, and beard. I added a storm bolter for good shootiness, and a power sword on his back for extra melee ability. A worthy captain, I feel. The old metal Blood Claws boxed set included a number of Mk. 6 armor types. For variety, I equipped them with actual Mk. 6 arms from the OLD plastic sprues. The spiky shoulder pad necessitates putting the company marking on the other shoulder, which looks fine and adds some nice variety to the models. Otherwise, this is a stock model painted like the rest of my Space Wolves. For the yellow shoulder pads, I paint yellow, then wash with light brown for depth. 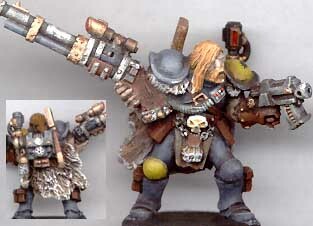 This metal model was armed with a plastic meltagun taken from one of the older Ork weapons sprues, and posed up nicely. The drybrushing and washing effects are executed very cleanly on this model. 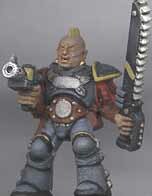 Another stock model from the old metal Grey Hunters box set. I had to do one of the knee pads in yellow, and it came out well- just big enough for a wolf paw decal. This model shows all the different colors I use on my Space wolves, including red for the cloak lining, gems, and grenade rim. The gold and steel parts are washed with brown for depth. I armed this extrordinary metal body with a power sword and hand flamer. 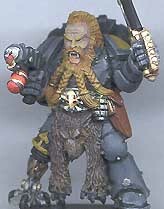 This is one of the nicest Space Wolf models I've seen, including a bionic leg, Mk. III style armor, crazy beard braids, and toothy smile! 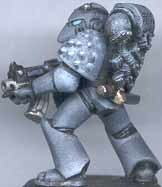 Although the new plastic Space Wolf models are incredible, be sure not to miss out on the old metal models for variety- they make great characters. 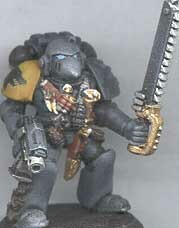 A standard Mk 7 metal Space Wolf, armed with a power axe and sheathed knife for that extra edge in melee. 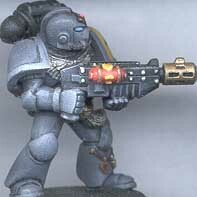 This is one of my favorite Grey Hunter models, just because the pose is so nice, with his head matching the gun direction. You can also see the light blue color I use for the Wolves' eyes, shaded with black. This Space Wolf Sniper started out as a Warzone model. I replaced the right arm with a Mutie Raider arm, and added a scope (from the plastic marine sprue) to the mutie rifle to make it look more snipey. The left hand's weapon has been replaced with a bolt pistol. 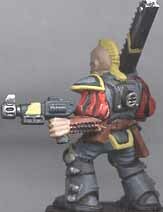 In the inset, you can see the back- the fur cloak is part of the original model, but the backpack is an old Space Wolf Sergeant pack, with a knife from the new Space Wolves sprue added to the side. A wolf tail was also added to the pack below the targeter. The final model looks good in grey! I've never pictured Space Wolves as devastator types, but Ed wanted to demonstrate why Lascannons are worth taking. How could I refuse? This is a metal devastator weapon and arms added to a metal blood claw body. The end result is a very characterful model! (I have yet to put one of the new devastator weapons on a stock model... I like them so much they always end up on more deserving torsos!). My Space Wolves color scheme works fine on devastators, apparently. I painted the power cables red and yellow, and most of the weapon and pack are black, with some steel and brass details (I particularly like the targeter that comes with the Lascannon). 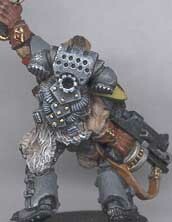 CLICK HERE FOR MORE SPACE WOLF MODEL MADNESS!